Bhagat Singh 28 September 1907 23 March 1931 Indian Sardar Kishan Singh Sandhu Vidyavati Politician, Social Activist An Indian revolutionary and socialist. Who is considered to be one of the most influential revolutionaries of the Indian Independence Movement. 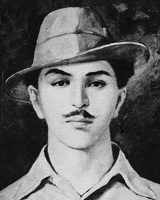 A list of popular Hindi Bhagat Singh quotes are given below.